Using skills that have been handed down for generations, the Amish woodworkers that handcraft the pieces from the Miller Bedroom Collection are true craftsmen. With their restless attention to detail and dedication to producing the highest quality furniture possible, their love for their craft shines through in every piece. Their passion for perfection ensures that your investment in American Made Amish furniture lasts for many generations to come. The elegant Louis Philippe Night Stand is crafted from hand-selected hardwood, ensuring character, longevity and beautiful presence in every piece. Featuring three dovetailed drawers with heavy-duty full extension side-mounted slides, rated to support 75 pounds and equipped with our unique Gotham drawer pulls, the Louis Philippe Nightstand will give you convenient and consistent service for many years to come. 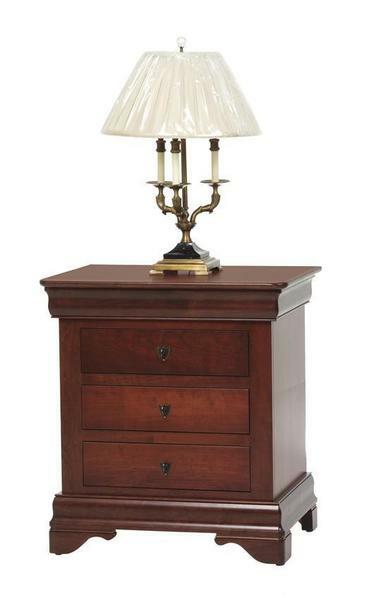 Available in a variety of wood and finish combinations, the Louis Philippe Night Stand can be tailored to fit any decor. Please call one our of furniture specialists today to help with any questions, toll-free at 1 (866) 272-6773. You can also place your order conveniently over the phone.